Description: In Basic Math Skills, Grade 2, you'll find just what you need to provide extra skill practice for individual students, small groups, or the whole class. These reproducible pages are perfect for homework too. * the skill at the bottom of each reproducible page. 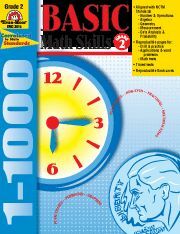 The reproducible flash cards for Basic Math Skills, Grade 2, cover addition and subtraction facts 11-18 and multiplication facts for 2s, 5s, and 10s.